Between 1300 and 1500 C.E. a new form of Sufi Islam took hold among central Islamic peoples, joining individuals through widespread networks resembling today’s prominent paths and orders. Understanding contemporary Sufism requires a sophisticated analysis of these formative years. Moving beyond a straight account of leaders and movements, Shahzad Bashir weaves a rich history around the depiction of bodily actions by Sufi masters and disciples, primarily in Sufi literature and Persian miniature paintings of the period. 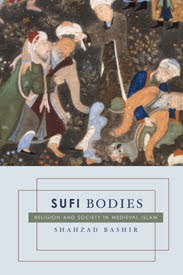 Focusing on the Persianate societies of Iran and Central Asia, Bashir explores medieval Sufis’ conception of the human body as the primary shuttle between interior (batin) and exterior (zahir) realities. Drawing on literary, historical, and anthropological approaches to corporeality, he studies representations of Sufi bodies in three personal and communal arenas: religious activity in the form of ritual, asceticism, rules of etiquette, and a universal hierarchy of saints; the deep imprint of Persian poetic paradigms on the articulation of love, desire, and gender; and the reputation of Sufi masters for working miracles, which empowered them in all domains of social activity. Bashir’s novel perspective illuminates complex relationships between body and soul, body and gender, body and society, and body and cosmos. It highlights love as an overarching, powerful emotion in the making of Sufi communities and situates the body as a critical concern in Sufi thought and practice. Bashir’s work ultimately offers a new methodology for extracting historical information from religious narratives, especially those depicting extraordinary and miraculous events. "Sufi Bodies provides a very useful, alternative view of Sufi issues, such as love and discipleship, that are often treated in abstract and ethereal—in a word, disembodied—terms. It will prove valuable for a range of audiences and courses." — Marion Katz, New York University"